What Part of the Grieving Process Do I Get to Become a Masked Superhero? There was recently a death in my family. My younger brother choked on a Glade Plug-in. What it was doing in his mouth, nobody knows. He wasn’t the sharpest tool in the shed. But it was sad nonetheless. When I found out last month, I went through all the stages of grief: shock, sadness, denial, anger, indifference, anger again, hilarity (come on, the way he died is really funny), acceptance, then back to denial, and now acceptance again. So after going through all of this, at what part of the grieving process do I get to become a crime fighting, masked superhero? All the superheroes have lost someone close to them before devoting their life to super-heroity. Spiderman lost his Uncle, Batman lost his parents, Superman lost his parents and his planet, Wolverine lost his dad, and later his girlfriend, and then later the girl he had a crush on, and then later some mutants he barely knew (it got progressively easier to piss him off), Thor thought he lost his dad but he was just in that God-Coma thingy, James Bond lost basically all of his girlfriends, and Ironman lost that one dude in the cave he was being held prisoner with during the first movie. 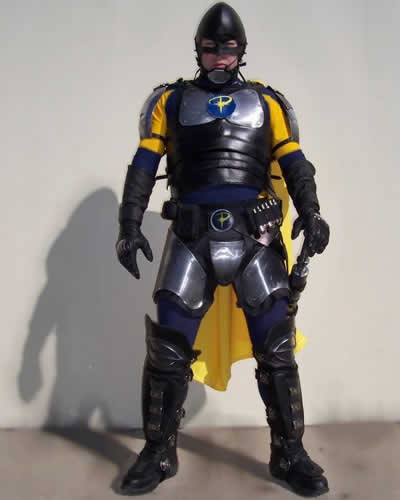 Who did you lose, real life superhero Citizen Prime from Phoenix? My brother was the closest person to me that I’ve ever lost. Except my father, but I didn’t really like him that much. Especially just before he died. He was just old and cranky all of the time. My brother was stupid but at least he was funny. 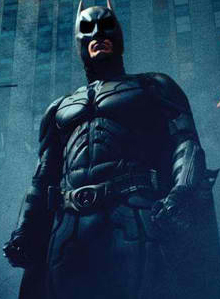 So after all the sadness and shock and all that, I finally get to become a caped crusader, right? Now I don’t have any natural superpowers, so I’ll have to go the route of Batman and Ironman and MAKE my powers from my best natural talents. But that shouldn’t be hard. I’ve got a garage full of tools, a collection of samurai swords and nunchucks in my “Man Room,” a toy crossbow I retooled to be a REAL crossbow, and a Hybrid car, so I should be able to make something cool and terrifying out of all that. And I’ve played enough video games that I should be pretty good at capturing bad guys and rescuing good people by now. Heaven knows I have the best zombie apocalypse escape plan ever. OH! And my wife has a taser. I’ll swipe that too. But there is this one thing that annoys me. In all of these superhero movies, there’s always some old, wise person or annoying ex-girlfriend that tries to tell the hero that fighting will not bring them peace. That’s bologna. This one time I was at a monster truck rally and the dude behind us kept screaming and bumping us with his knees and spilling beer on me and my son, so I finally stood up and knocked him straight in the teeth. I can tell you I felt very peaceful all the way to the police station. 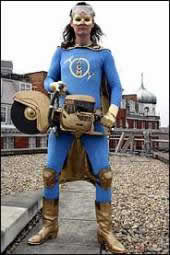 I feel your pain, too, real life superhero Angle Grinder Man from London. So I guess that’s it. I’m officially at the “Become a Masked Superhero” stage of the grieving process. I guess I should thank my idiot brother up in heaven for giving me this chance. Without his stupidity, thousands upon millions may not have known sweet, pure, nunchuck-y justice. Oh, and I’m NOT telling you what kind of superhero I decided to be. I’m not giving away my secret identity that easily, so stop asking. If you really want to know, commit a crime that you think you’re sure to get away with. Then you’ll find out first hand. Justice will find you. And this time, he’s driving a Prius.